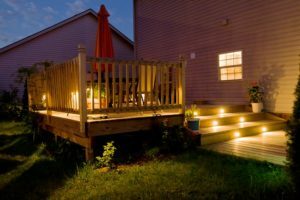 Decks - Volpe Enterprises, Inc.
Transform Your Outdoor Space Into An Oasis with Volpe Enterprises! 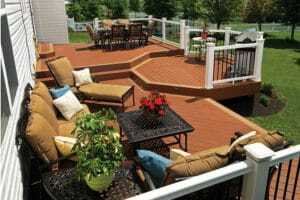 Volpe Enterprises’ Deck Specialists can help you decide what kind of deck you need. Do you dream of spending some time away from the kids and the household chores relaxing on your private maintenance free deck? Do you think about entertaining your family and friends for an afternoon of barbequing or an evening of fun with music, drinks & food? Maybe you envision yourself relaxing on a cool summer night reading your favorite book under the stars. No matter what your dream or vision is Volpe Enterprises can make your dream a reality. Volpe will provide you with design ideas and installation services so you can begin enjoying your new outdoor living space as soon as possible. Volpe Enterprises, Inc. has a proven track record since 1970 for providing the highest level of service in the industry. We continue to maintain this level or service by not using sub-contractors and employing only the finest craftsmen in the Eastern Pennsylvania area. Being in the industry since 1970 Volpe Enterprises has completed all types of decking projects ranging from replacing a few rails on an existing deck to designing and building multi-level decks from the ground up. We will provide all the necessary permits and work with local engineers and architects to make sure your project, whether large or small, is a success.